The martial arts. There are few areas of interest available that offer such rich and diverse subject matter. This is one of the reasons I love writing about them, but ironically, this can become a pitfall. It's easy to delve into related areas such as psychology, ethics, and even esoterica and get so far removed from the original topic of the martial arts that they are no longer being addressed. A case in point is the problem of accurately defining what the martial arts are. The soaring popularity of tai chi and mixed martial arts (MMA) fighting contests, for example, make it clear that certain disciplines that are given the generic label of "martial arts" are neither martial nor artistic. Internal styles such as tai chi tend to draw a pacifistic following that want nothing to do with combative fighting methods or racking up a collection of tournament trophies. Equally, an MMA fighter has little or no interest in meditation, chi, or adopting a canon of philosophical tenets in accordance with bushido. The modern martial arts, as I see it, have as much to do with the ways of fighting as they do with certain concepts unrelated to fighting. Bujutsu (martial arts) and budo (the martial path) are two sides of the same coin. The problem arises when exponents from these camps see as what they do as being exclusive, and lines are drawn. A similar schism that exists in the martial arts concerns the time-honored traditional ways versus the eclectic schools of mixed-martial arts. An Isshinryu karate school I once visited had a sign up that read "We Teach Traditional Karate". Isshinryu was systemized in the 1950s. Can something that's been around for just half a century be categorized as "traditional"? Actually, its founder, Shimabuku, wanted to do away with the stagnation of tradition in creating a progressive style of karate. The advent of mixed-martial arts were influenced by Asian combative systems and are seen as something new. Yet the ancient Greeks had developed a combative sport called pankration that documents training methods and techniques that bear a striking similarity to the current mixed-martial arts methods that are in vogue today. This is a timely post considering the email I sent you. As someone who loves karate and kobudo, I think it's very interesting to see other styles. I think that all types of the martial arts have been adapted in some ways through the years despite the Masters' attempts to ward off the grapevine effect. The thing that bothers me about some proponents of mixed martial arts is that they seem to love to trash talk traditional styles like mine. There's value in all forms. I thought Isshinryu had been around for a long time. I learn something new every time you post. As I was reading, I have to agree that the term has become very generic when it shouldn't be. My first reaction was as you said, there's not a lot of "martial" in tai chi, and there's not a lot of art in Mixed. Songahm TKD, which is what I am learning, is what is taught by not only the American Taekwondo Association (or ATA, which I belong to), but also it belongs to the WTTU, or World Traditional Taekwondo Union, and the STF (Songahm Taekwondo Federation), the latter two of which are international branches of the ATA. I know that the Eternal Grandmaster started the ATA in 1969, so that's even more recent than Isshinryu for sure. However, as legend has it, he was well versed in taekwondo and karate, and being that he was Korean, and taekwondo has its origins in Korea, he wanted to bring more of the original Korean elements that weren't being taught back into the style he wanted to teach, which involved all those ever-popular kicks that TKD is known for. I'm sure, too,that he wanted to not only incorporate the traditional aspects of taekwondo, but make it accessible in a modern world (for example, a lot of English is used to teach instead of Korean, so that way students can learn more quickly and retain he information in their own language better). So perhaps that's what that particular dojo meant. Who know? And my opinion between those two forms you mentioned-- tai chi is closer to being a martial art than the Mixed. The Mixed is just fighting with any means possible. The Tai Chi retains some elements of the fighting and forms, but works on the eternal, because the power is not in the physical, but in the mind, right? I have been giving a lot of thought to the martial art/meditative art issue lately, as it has appeared on other forums also. I will be posting my thoughts on the matter at dojorat.blogspot.com , specificly why Tai Chi appears to have lost it's martial aspects, and how it is being brought back now. There's so much I'd like to say to this post that I don't know where to start! For a while I fell into the 'my Martial Art is the best one' trap and I think that some schools encourage such beliefs. I suppose from a teacher's point of view, it's like trying to teach someone tennis when they're also learning sqaush. Especially in the beginning, I suppose it's easier if you stick to one thing or you run the risk of diluting or even polluting what you're learning. I think in the end it all comes down to intent. If you want to learn to fight so that you can win a street fight, Martial Arts may not be for you. If you want to learn about yourself and the world around you, I know of no better place to start than with a Martial Art. Any Martial Art will do - internal or external. It's about finding the one that's right for you. Taekwondo doesn't work for me. Kung Fu does, for some reason. A friend of mine runs a MMA school near me. He has black belts in jiu-jitsu, judo, and Isshinryu karate. Like you, he sees the value in all the different ways. But moreover, because he's an adept at various styles, he can have a deeper understanding of each one. People love to "trash talk" what they in fact know little about. The way tai chi is presented today has little or nothing to do with combat. Internal styles, like tai chi, make them difficult to grasp for many, and its main emphasis of chi seem to elude most people, especially how it's all mysteriously connected to something that's supposed to be "martial" in nature. But the fellow that I mentioned to Black Belt Mama that runs the MMA school near me thinks tai chi is the ultimate martial art! Tai chi can be made totally combative, while MMA has its own core values. Thanks, Dojo Rat. I'll be looking for your article. It's about finding the one (style) that's right for you. I think that pretty much says it all. And it's a matter of focus - that is, what your goals are in that particular style. TKD has a sport element that's very challenging. Internal styles are perhaps the most difficult of all. But like you say, it's all about discovering ourselves - which can be the most enduring quest of all. Remember the story of when Master Shimabuku's students were trashing other styles? He responded, "All bottles are good." There are good points and weak spots in every style. Isshinryu is right for me because it fits my body and my style, but that doesn't mean other styles are inferior. On another note, I feel like Isshinryu is a traditional style, even though it is not an old style. The style itself may be new, but it follows old concepts. I consider a non traditional style as the ones who compete in tournaments with kata that look more like gymnastics routines (complete with tumbling runs) than karate kata, and bo kata that look like baton twirling competitions. I like the questions that you pose with this article, things like "What is traditional? ", "What is Martial?" etc. They cause the reader to think about their art. Last time I checked (last year?) there were around 230 different styles of karate (official ones). How much "new" knowledge, how many new techniques are there?? How many "new" ways are there to actually break an elbow? In history classes, we saw a drawing of techniques done. They are very similar to some joint locks in aikido or jujutsu. There is a modern version of Pankration. and according to the website, the concepts or ideology is very close to what you could find in karate. Well, it's true that the martial part is let down in most schools. But anyone with a martial background can easily understand what the forms mean. There are subtleties that remain unseen, but the main gross idea is pretty clear. You know what, I just realized there is a lot of racism in martial arts. And what causes racism? Not bombs(just kidding) ignorance. I feel like Isshinryu is a traditional style, even though it is not an old style. The style itself may be new, but it follows old concepts. Right, I think Shimabuku really wanted something that embraced traditional ways with practical concepts. He actually saw "traditional" karate as being ineffective in an actual fight. The other thing with "traditional karate" as a term I believe has to do with a lot of styles being given the general term "karate" when it's not authentic karate. For years, tae kwon do was called Korean karate just so people would have an idea of what it was. So when one says traditional karate we know we're talking about a style that has distinct Okinawan roots. Some people may disagree with that definition, it's just how I see it. I consider a non traditional style as the ones who compete in tournaments with kata that look more like gymnastics routines (complete with tumbling runs) than karate kata, and bo kata that look like baton twirling competitions. Those routines are interesting, but strictly speaking, that stuff isn't even martial arts. I'd like to see some self-defense applications for a move that entails throwing a bo ten feet in the air while the performer does a somersault! I must've been home the day that was shown in class. All bottles are good as long as they're being presented by the right people. When Funakoshi introduced karate to the Japanese all those years ago, he was the right man for the job. Had it been somebody else, like Choki Motobu (street fighting specialist), the development of karate may have taken a different path as we know it today. 230 karate styles? I can believe it. It used to be 50. It seems everyone wants to be the founder of a new style. Taekwondo,whether you have ITF or Kukki (WTF) lineage, is similar in age to Isshinryu. Yet the "Traditional" Taekwondo VS "Sport" or Modern Taekwondo is an on going battle. Here is a short Article I wrote about this in 2003. John - on your recommendation, I am reading "Living the Martial Way" - and while I am enjoying it, one of the issues I take is the very narrow view the author has on what is "true" martial arts. Many points he makes are valid, but I find it interesting how confident he is in his definition of "real" martial arts training. Given my heavy sport background, its not surprising I don't completely agree with him. Contrary to the authors view, I believe competitive battle from the days Musashi, can be compared to organized competition today, even if losing does not mean dieing, especially in arenas such as MMA, Olympic Taekwondo or boxing where getting "Knocked out" is a very real possibility. I am reading "Living the Martial Way" - and while I am enjoying it, one of the issues I take is the very narrow view the author has on what is "true" martial arts. It's funny, but Forrest Morgan (the book's author) actually said something similar about historian Donn Draeger's definition of martial arts. As a term, "true" can be very subjective. I believe competitive battle from the days of Musashi can be compared to organized competition today, even if losing does not mean dying, especially in arenas such as MMA, Olympic Taekwondo or boxing where getting "Knocked out" is a very real possibility. 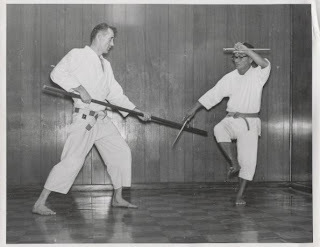 "Had it been somebody else, like Choki Motobu (street fighting specialist), the development of karate may have taken a different path as we know it today." Then, I'm thanking my lucky stars that it was someone like Sensei Gichin Funakoshi that developed karate a long time ago.